This is my first year as a camp tutor. After 25 years as a classroom teacher I have never seen the rate of success these students are able to accomplish. These kids get hooked on books! My favorite time of day is the morning reading hour. You may see campers snuggled on a couch, sitting on the bridge, on a rock, on a blanket in the grass, or in a hammock reading to counselors or tutors. I can’t wait until tomorrow morning. There we are then, another week has flown by here at Camp! It’s been yet another busy one too. Swimming is going really well and the campers are coming on by leaps and bounds in the pool, some classes have even been going over different dives this week and demonstrating their skills. Woodshop and art are still giving great enjoyment to the campers, who have been making all sorts of different things this week. Evening activities have ranged from free swims to campfires and are always greatly enjoyed. 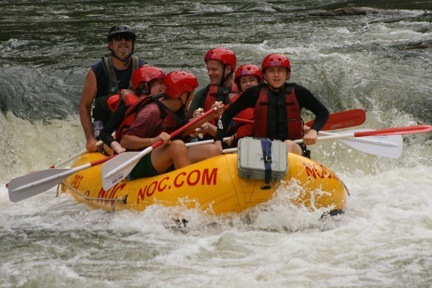 The weekend saw the camp split up with all the over 12’s heading to the Nolichucky River to go White Water Rafting, while those under 12 got the chance to go tubing! Both activities were fantastic and both groups had an awesome time! One camper and one counselor did manage to fall in during rafting, to the hilarity of others, but both were fine and quickly back in their rafts. Sunday saw a visit to Wilson’s Creek, always a favorite, and the campers once again delighting in jumping into the pools and off the rocks. So, another fantastic week has been had here at camp! We're into week seven and will have more to post next week-stay tuned! Newer PostWeek Seven-seems like yesterday! Older PostWeek Five and into Week Six!